Observatories ★ attended the observational campaign of Phaethon in 2017.In 2018, the collaborative network becomes larger. 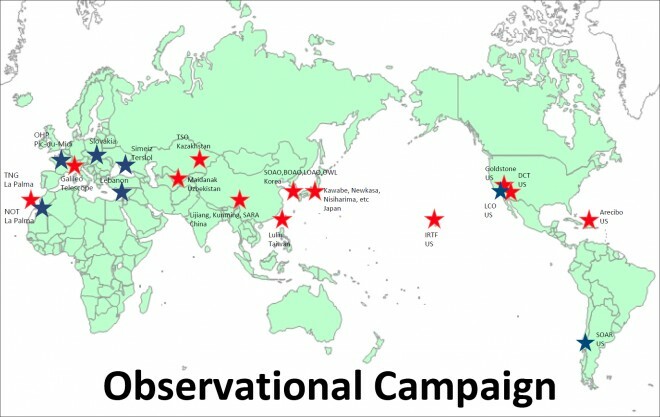 Addition to the ★, the ★ observatories will attend the campaign of Phaethon and 2005UD in 2018.If you are interested in participating in observational campaign, please contact Fumi Yoshida @PREC, Chitech (fumi.yoshida@perc.it-chiba.ac.jp). Asteroid 2005 UD is a possible second target of the DESTINY+ (flyby mission of asteroid (3200) Phaethon that is the parent body of the Gemini meteor stream). Observations are being proposed in coordination with the mission at the following observatories. Researchers in China, Finland, France, Germany, Italy, Japan, Kazakhstan, Korea, Lebanon, Russia, Slovakia,Taiwan, Uzbekistan, Ukraine, and USA are joining the observational campaign of 2005UD in 2018 fall. This asteroid is a possible fragment of Phaethon because the orbits of 2005 UD and Phaethon are very similar. That’s why this asteroid is nominated a second target of Destiny+ mission. After the completion of the flyby to Phaethon, the spacecraft may visit other asteroids. 2005 UD is the highest priority target in this stage. Compared with Phaethon, we have little knowledge about the physical properties of 2005 UD. Therefore, we want more spectra, polarimetric data, absolute magnitude etc. for this asteroid. This year (2018) is a very good opportunity to observe 2005 UD with the wider phase angle. Please see below. 2005UD will become bright in October 2018. During 2018-Sep-16 to Oct-27, it is brighter than 17 mag. The phase angle changes ~0 to 95 deg as follows. So, it is a good chance to get its phase curve, the absolute magnitude, and the slope parameter by photometric observation. The spectroscopy is also very important. Phaethon’s spectra have been studied. Most of them matched with that of B-type. But, very strange spectra were seen sometimes (Licandro et al., 2007). If such strange spectra are seen on the surface of 2005UD, which is a possible fragment of parent body of Phaethon, they might be related to fragmentation event which formed Phaethon and 2005UD. DESTNY+ may be able to see such interesting surface during flyby. So, rotationally resolved spectra of 2005 UD can be a good information source for determining the flyby trajectory of the spacecraft. The polarimetry is important, too. So far no one does polarimetric observation of 2005UD. As mentioned above, the phase angle of 2005 UD changes ~0 to 95 deg in 2018 fall. This is a good opportunity to investigate polarimetric parameter of 2005UD and then compare to that of Phaethon. In this year, Phaethon is darker (~18 mag) than in 2017 apparition. Small telescopes are not suitable for observing Phaethon this year. But, if larger telescopes are available, it’s still important to observe Phaethon this year. Last year (2017), Phaethon was observed with different phase angles (>~20 deg). As you know, Phaethon’s solar phase angle does not become very small because of its orbital geometry. However, the smallest angle reaches to just 8.6422 deg in 2018. So far there is no observation of Phaethon with the phase angle < 10 deg (see Figure 2 in Ansdell et al. The Astrophysical Journal, 793:50 (8pp), 2014 September 20). So it is a good opportunity to observe Phaethon with small phase angle and to get more precise estimation of absolute magnitude. Ito et al. published a paper on Nature Communications about polarimetric observation of Phaethon (https://www.nature.com/articles/s41467-018-04727-2). The authors claims that it is possible that the albedo of Phaethon is much smaller than the current value. It may be because of the very rough estimate of absolute magnitude of Phaethon in past literature. Clearly it is very important to observe Phaethon with smaller solar phase angle, and it is possible in this year (2018 November). Phaethon’s albedo information is very important for future science including the Destiny+ mission. There is no published polarimetric data of Phaethon with the solar phase angle smaller than ~20 deg. Japanese group tried to get telescope time of Subaru telescope, but is was rejected by the reason of telescope maintenance in November 2018. If someone obtains the polarimetric data of Phaethon in this November, it will become a precious data for Phaethon’s polarimetric character. Through the observation campaign in 2017 winter, we received a report that there is a slight mismatch of rotationally resolved spectra taken ten years ago (2007; there is B-type like part and C-type like part on the surface) and those taken in 2017 (the most part of the surface is C-type like). So, spectroscopy of Phaethon in 2018 is also interesting from different geometry (Phaethon-Earth-Sun). Phaethon is brighter than 18 mag during 2018-Nov-05 to 29. During the period, its phase angle will change as follows.